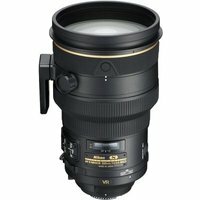 The Nikon 200mm f2 G ED AF-S Nikkor VR II Lens is a top end pro-quality lens that features the unique combination of a large f/2.0 maximum aperture and Nikon's Vibration Reduction (VR) system for incredible low-light performance. Various auto-focus modes including AF-On, AF-L and Focus Pre-set can be controlled by buttons on the lens itself. These functions, along with the Silent Wave Motor (SWM) enable fast and quiet auto-focus in any situation. The Nikon 200mm f2 G ED AF-S Nikkor VR II Lens features four ED glass elements, including one Super ED glass to keep the lens length to a minimum and help to minimise aberrations for sharp high contrast results.